Krista & Aaron embarked on their home search in 2014. Residing happily on the creek in Keewaydin. Their craftsman fourplex had enough period detail to provide a daily sense of the vibes and feels that are ever-present in a vintage home. The goals early-on were very clear: obtain a space with originality, that needed updating in poignant spaces, within Nokomis and creek walkability. These are two personas that will destroy any task management hurdle that is presented to them. Aaron’s amazon LED flashlight, guided their discerning hunt through Hale, Field, Keewaydin, and Diamond Lake. It was so refreshing representing truly patient, and almost unemotional investors, mining for the one that would deliver the storybook ending to a marathon of moth-balls and mac windows. 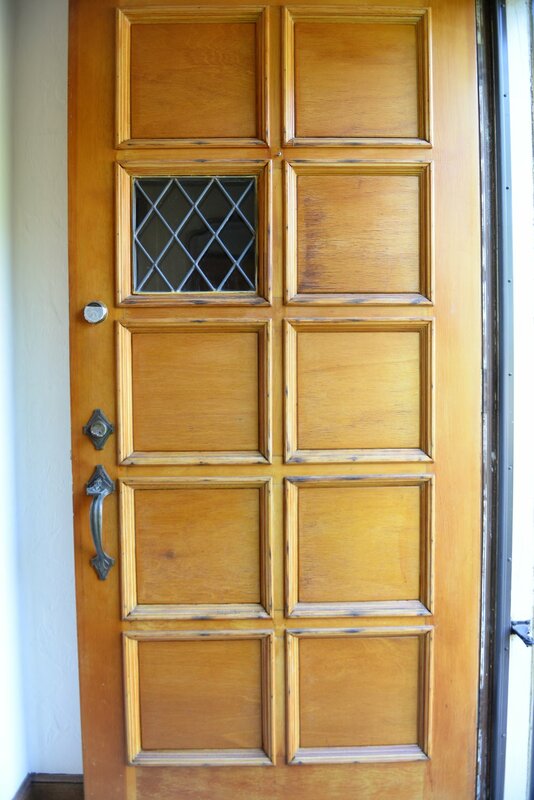 If tudor turns your wheels, Nokomis is the nordic oasis of late 20’s to 1938 era art deco & craftsman influenced tudors. As with many searches, we likely saw the brightest stars before true fiscal and mental preparedness was achieved. Once we make the conscious call to pass on potential gems, it raises my bar as the purveyor of the classic home. This journey granted the strength and vision for Aaron and Krista to identify a true wealth of opportunity in their 1935 tudor, its absolutely certain that without this process, they would not have understood the potential of their pearl. The eventual victor was a 1935 english tudor, with Chicago asbestos brick entry and a wool shag textile that could only be from the Nixon era. The door above is so unique with its square patterned and argyle leaded glass window, summer 2018 Aaron is planning a revival of the entry door. Sweat Equity is the Best Equity. Reins so true in the story of Krista & Aaron. This home had been in the same family since 1959. Its principal captain for decades, happened to be a period lighting enthusiast- constant lighting maneuvering happening from stem to stern. The intact lighting from room to room is what really pressed my emotions, in urging them to dive in eyes wide shut. Upon entry, the dormant scents of our elders immediately evoke the emotions from storytelling and generational growth and communal involvement. I contacted them via text at their respective workday creative spaces, with an alarming tone of definite finality. As we had passed on 45-50 homes, it only took 3 steps into the living/dining to know this was it. Equity gift wrapped with a layered bow, is pictured above and below. Nothing beats the shag covered hardwoods, wool draperies, and agents that list homes with that corporate flat footed approach. Symmetrical radiators flank the tudor fireplace, soon to have a pop of accent color that Krista will pull from her design centric world of photography, Aaron’s approval will certainly be required as he himself is a phenom of a video editor for a downtown agency. PERIOD lighting exists even in the knee-wall closets! Below is a series of only a portion of the deco era fixtures that survived the removal period of the 80s/90s and big-box led oughts. There is an acute priceless to landing a classic home with this complete soundness of a lighting lineup. Even the closets and attic knee-walls have deco era fixtures! The bath should be historically registered. Aaron & Krista spent a majority of their pending market time to hunt down a myriad of jade tiles to match the '35 tones for their bath restoration. The kitchen below is actually is fabulous condition, the toucan caribe aqua stain will be enameled this winter to create a pop (or sold to our lovely neighbors Hola Arepa? ), and give them a facelift phase to place the major kitchen renovation on the backburner. Wallpaper removal is a no-nonsense DIY task, a testament of their determination and drive in the process photos below, taken just weeks after closing. The Rare Form Stain Cocktail--sample day on freshly sanded white oak, doesn't get much better than seeing your hardwoods newly sanded and the pop that each blend of oils gives them. They aren't disclosing the final blend, stay tuned for updated photos upon completion! If you see these two beauties on the trails around Nokomis or Minnehaha, please thank them for saving a piece of Minneapolis period architecture. Love Nokomis Tudors, want to save one of your own? Sign up today w/ your email address to receive all things classic homes in Mpls.